Finally after a little over 2 years, sequel to the "crazy" superhero movie that was very successful then, premiered in Indonesian cinemas yesterday, which was a bit earlier than in the US itself. So we could count ourselves quite lucky to have seen this movie first. It was also rather odd that the film was shown on a Tuesday rather than the usual Wednesday. But for us, it is better since we need something to relieve our stress after few days of horrifying news in the country. So did the movie deliver? Let us find out below. Wade Wilson aka Deadpool (Ryan Reynolds - The Hitman's Bodyguard, Green Lantern etc) was making huge name by killing lots of criminals throughout various countries. Meanwhile in his private life, he was having a serious relationship with his girlfriend Vanessa (Morena Baccarin - Gotham, Homeland TV series etc). Later on Wade was approached by Colossus (Stefan Kapičić) to join the X-Men and become a trainee. During a mission with Colossus and Negasonic Teenage Warhead (Brianna Hildebrand), Wade would meet with a young mutant named Russel aka Firefist (Julian Dennison - Paper Planes) who created a lot of trouble. Meanwhile a mysterious mutant who was very strong and powerful called Cable (Josh Brolin - Avengers: Infinity War, No Country for Old Men etc) came into the picture and did not hesitate to kill a lot of people to achieve his personal mission. With such powerful enemy, Wade felt he could not fight Cable alone. Together with his best friend Weasel (T.J. Miller - The Emoji Movie, Silicon Valley TV series etc) they enlisted the help from other mutants who consisted of Domino (Zazie Beetz - Atlanta TV series etc), Bedlam (Terry Crews - The Expendables series, Blended etc) and few others. So could Deadpool and his team who he referred to as X-Force defeat Cable and ruin his plan? Find them all in this hilarious fun absolutely entertaining movie. Wow, this movie truly delivered. When I saw the first Deadpool movie, I was surprised at the totally different way of showing a superhero and I was really intrigued of how they would pull it off again in this sequel. It turned out that this time around, the action sequence was even grander and more amazing. I totally loved the scenes involving Domino, Deadpool and Cable in the city which were absolutely thrilling. And I was also amazed during the finale fights scene as well. With a great sound system from the theater, it really gave the complete awesome experience. Just like in the original movie, there were so many funny moments which were delivered by the actors (mostly involving Deadpool and his friends). One person that was given quite a lot of comical role was the taxi driver Dopinder (Karan Soni) reprising his role from the first movie. Almost all the scenes in the film were funny and I personally felt that this one was even funnier than the original movie. It gave us various jokes and one liner, making fun of so many things which gave all the audience a good amount of laughter. My wife and I really enjoyed watching this movie as it made us laughed really hard a lot of time. 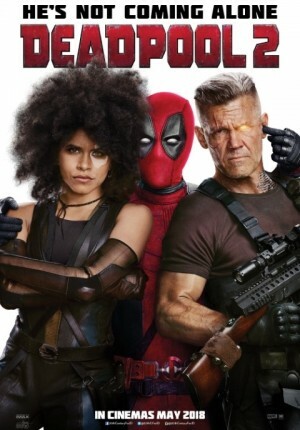 My own personal favorite funny moment would definitely be during the scene involving Deadpool and his old roommate Blind Al (Leslie Uggams - Sugar Hill, Empire TV series etc) which was really hilarious. The pace of the movie was quite fast but there were occasional slower paced more dramatic scenes here and there. There was even a brief moment of touching scene towards the end that affected my wife a bit, especially since it was accompanied by the nice unplugged version of Take on Me from A-Ha. The songs from this film were mostly nice & enjoyable as well. Through the entire movie duration which lasted for 2 hours, audience would be filled with a lot of craziness and jokes which should not be taken too serious. Like in all Marvel movies, this one also had 2 mid end-credit scene with the latter one also quite hilarious and should not be missed. What I also like about this movie was the additional characters in this sequel were actually quite memorable. Domino was an awesome superhero and really kick-a$$. Cable was amazingly characterized by Josh Brolin (who was able to transform into a different character from playing Thanos earlier). And Russel was also greatly portrayed by the young Julian Dennison. The chemistry of all those characters were nice to see and you would notice that they really had great fun playing this movie. Oh and be sure to try and find out who portrayed 1 mutant called the Vanisher. One thing that I noticed missing here, were the breaking of the fourth wall was not as frequent compared to the original movie and replaced more by the narratives by Deadpool. In the end, this was a very fun, enjoyable and entertaining superhero movie, which was very violent, had an R rating and should not be seen by children. There were so many killings, body dismemberment and foul language used here that were really not suitable for the young audience. So if you are a fan of the original movie, you should definitely watch this one and I am sure you would have just as much fun as my wife and I did.